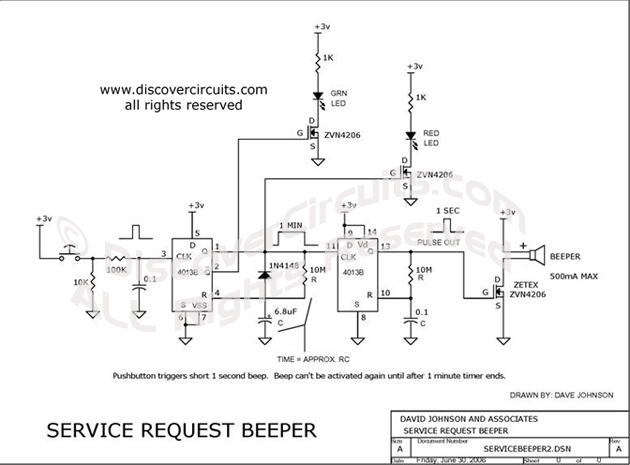 Circuit-Front Desk Service Beeper __ Circuit designed by David A. Johnson, P.E. Often a simple mechanical bell is used by a customer at a store or hotel lobby, which when activated alerts the personnel that service is requested. This device functions like a lobby desk service request bell. A short beep is sounded whenever the large pushbutton on top of the device is pressed. Once pressed, the device will not make another beep until at least 2 minutes of time has elapsed. This prevents impatient customers from ringing the bell over and over. The hobby circuit below performs the same function electronically. It also contains a timer circuit, so the service beeper can only be activated once every 30 seconds or so. This prevents some impatient person from ringing multiple times.